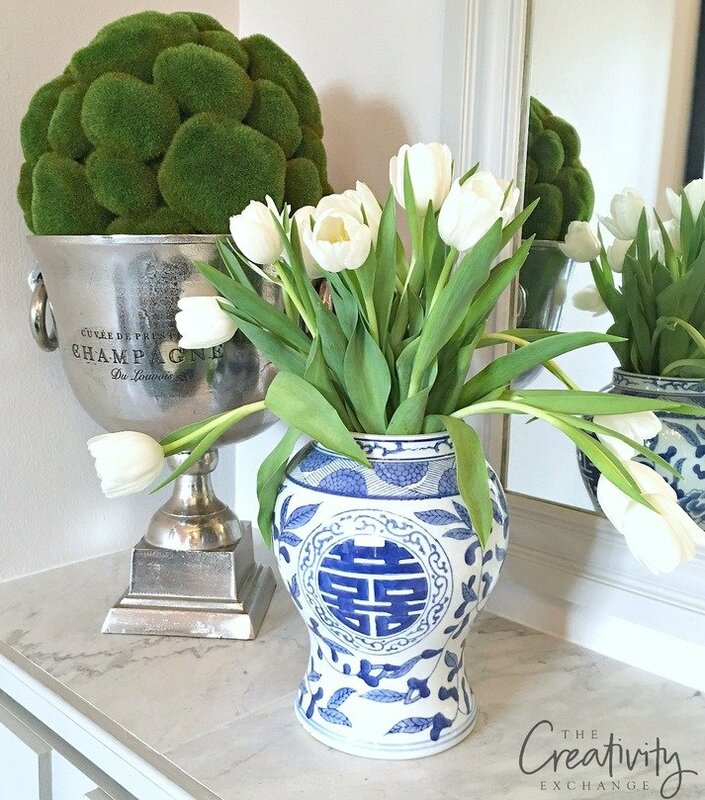 Having fresh flowers in the house is an instant mood-lifter, especially in the spring when the flowerbeds just begin to wake up from winter and burst with bright colors. 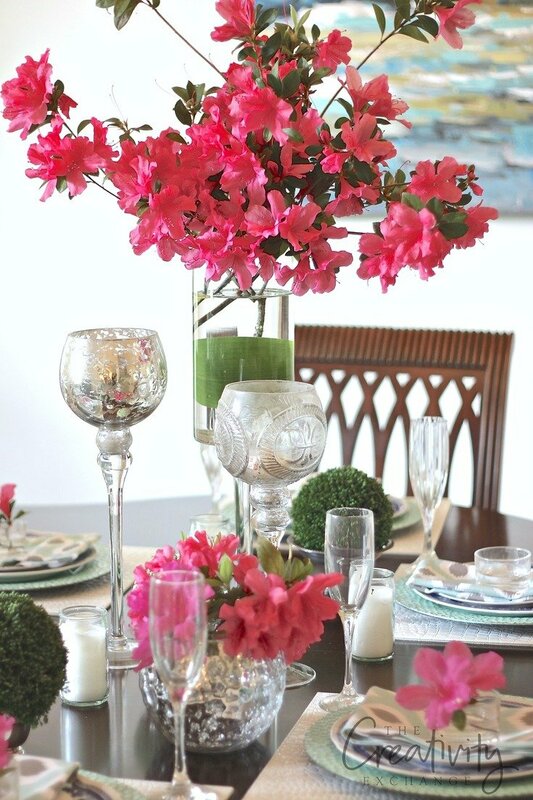 Vases are a classic container to hold fresh blooms, and if you have a pretty glass vase, great—but don’t stop there! 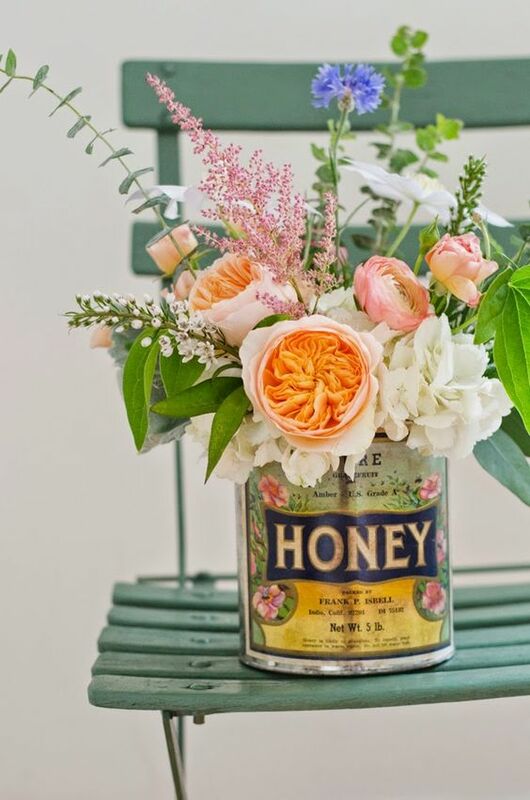 Whether you’re using flowers from your own yard or dressing up a store-bought bouquet, here are some creative DIY flower arrangements, ideas and unique vessels/vases to inspire you to fill your home with fresh blossoms. If you have a rectangular or an oblong vase like the image below by Tumblr user angelabella, you can make your own ombre tulip display. A leaf wrapped around the base of the stems adds stability as well as a pretty visual element. Who says you need to limit yourself to one vase? 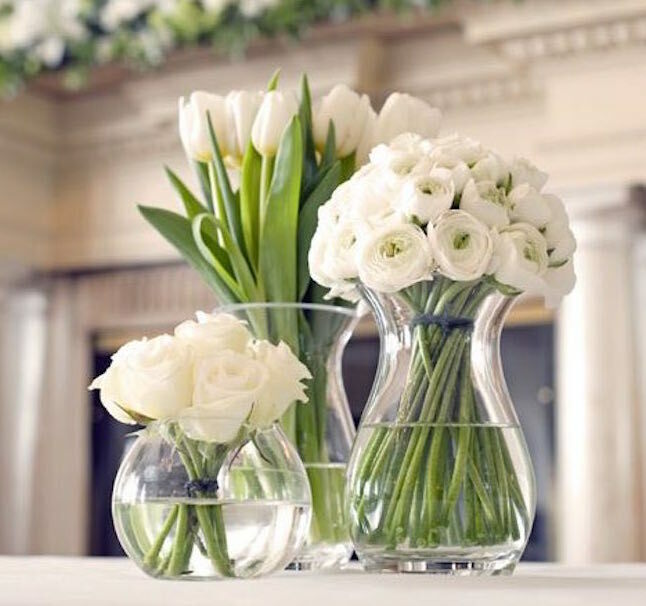 A trio of vases filled with all-white flowers, like these shown by Indulgy user Ashjan89, make an eye-catching display. 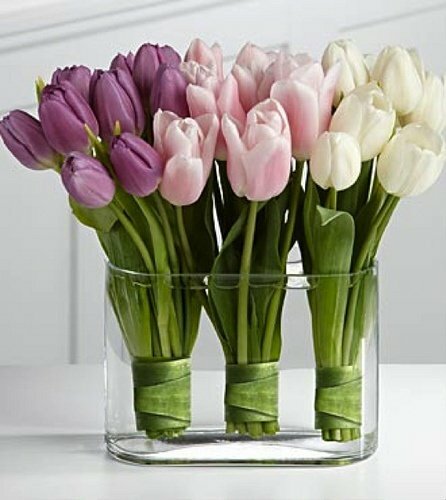 Dropping a few stems of tulips or other flowers in tall vases makes a high-impact centerpiece. Best of all, you don’t need a lot of flowers to create a stunning display like this—perfect for when you only have a few blooms in your flowerbed. Anything can serve as a vase! 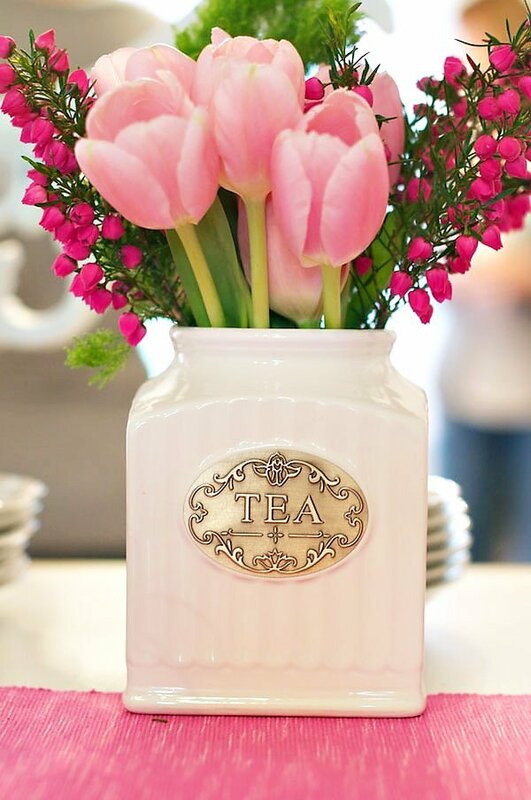 At a tea-themed baby shower, Abby Capalbo used a lovely tea canister for this sweet pink arrangement. Vintage cans and tins with old labels are another unique vessel idea. 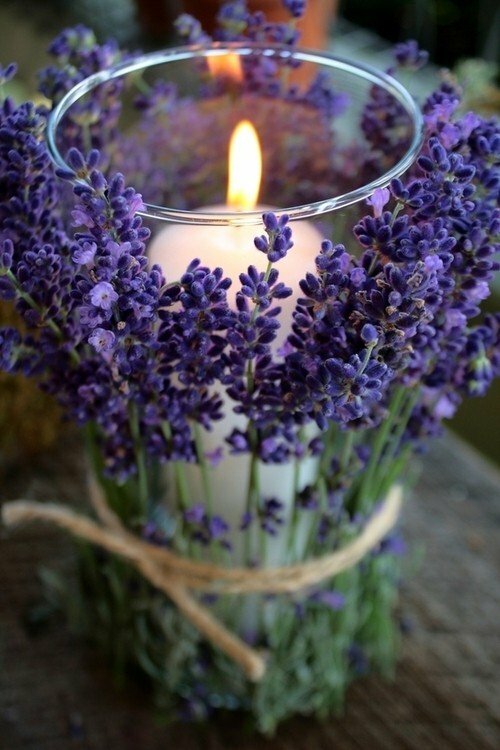 Canning and mason jars are versatile, inexpensive, and popular in all types of décor. Here, they make a simple and pretty vessel for fresh flowers. 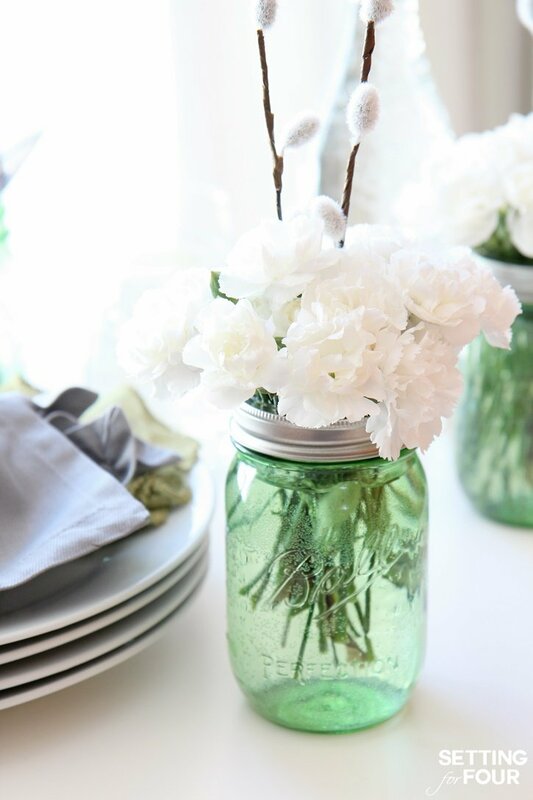 Mason jars can be tinted to any color for an added pop. 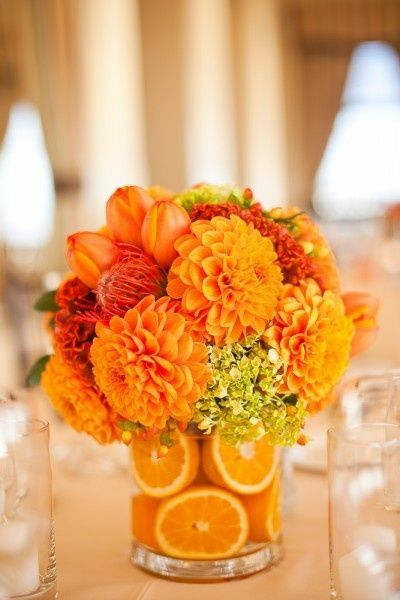 We’re loving this color combination from Ella Bella Floral. 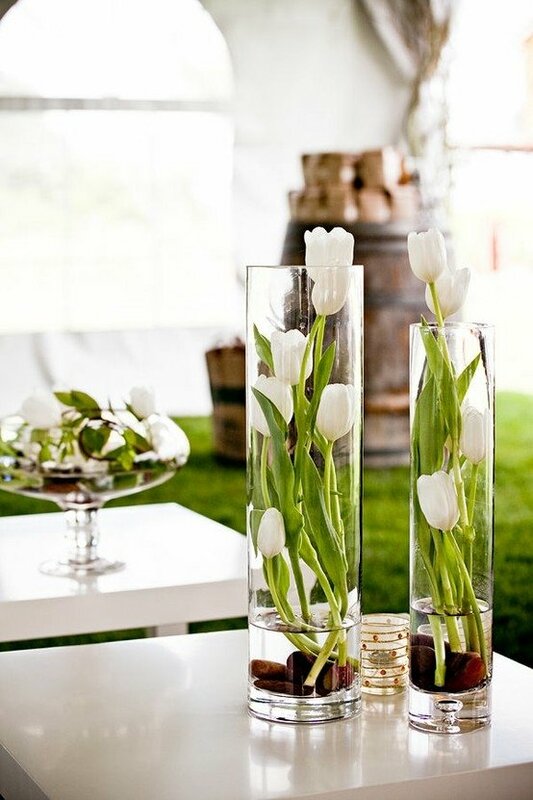 Tall glass cylinder vases create instant drama and make the perfect centerpiece. If you have flowering trees or shrubs like these azaleas, backyard clippings turn into something extraordinary. 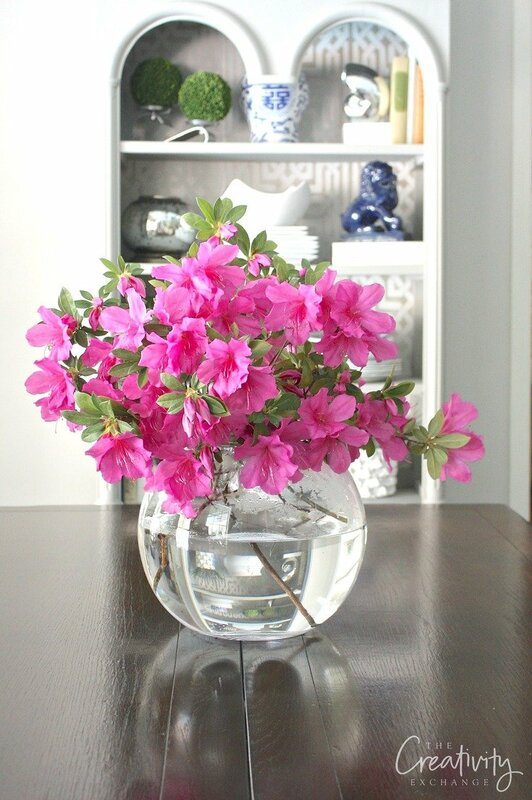 Large round glass globes are are another great way to create an instant arrangement with flowers and branches from the yard. 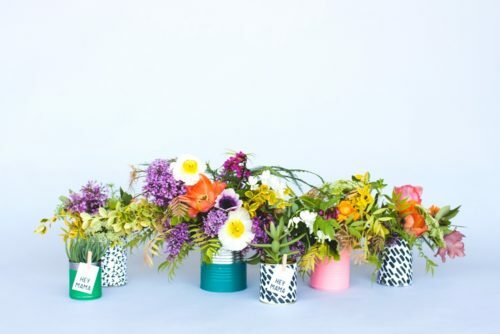 Rae Ann Kelly upcycled tin cans into quick, easy, and inexpensive vases that look lovely filled with fresh wildflowers and greenery from her yard. You also can clip a note or photo to the side and give as a gift! How about using a pineapple? 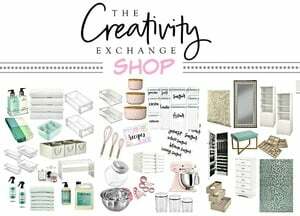 So creative from Lauren Conrad. 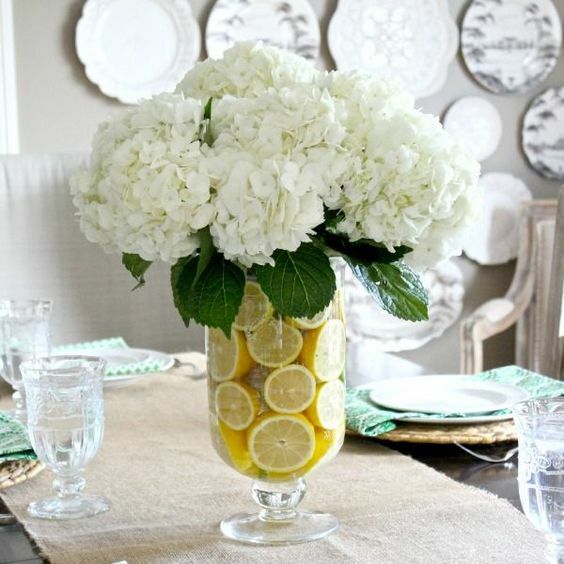 Speaking of fruit, why not add some sliced fruit into a clear vase like Kris from Driven by Decor did below. 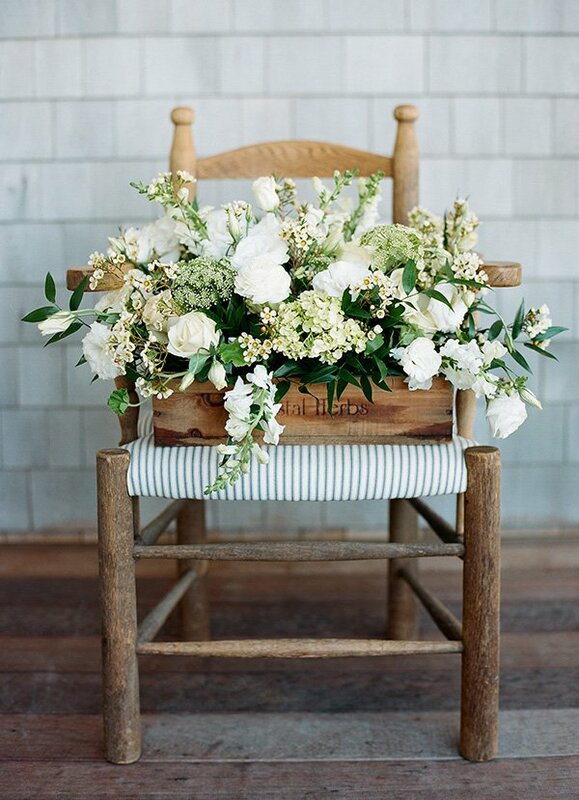 You can easily duplicate the look of this pretty arrangement, which is actually for a wedding, in your home using a simple wooden box as the vase. 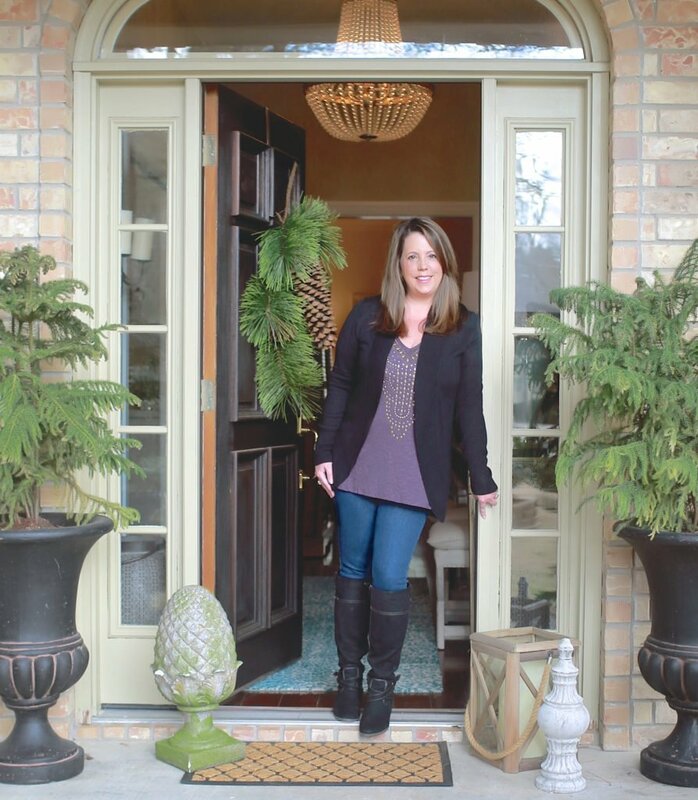 Imagine how welcoming this would look on a front porch! “April showers bring May flowers,” or so the saying goes. 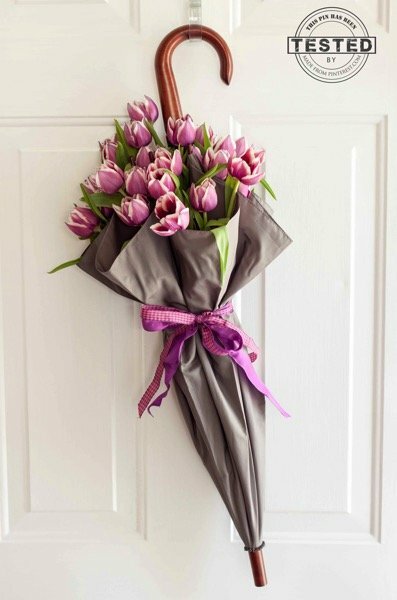 So why not use an umbrella for a fun vase, as Sherri from Made from Pinterest was inspired to do? You’re sure to get lots of compliments! 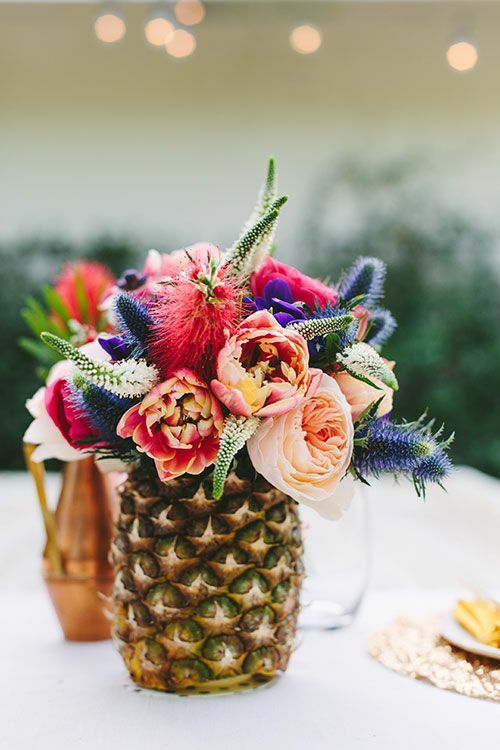 Tucking some fresh fruit into the water, as Dream a Little Dream Events did in this centerpiece, not only hides the stems but also adds another pretty visual element to any bouquet. This works for sliced or whole fruit! 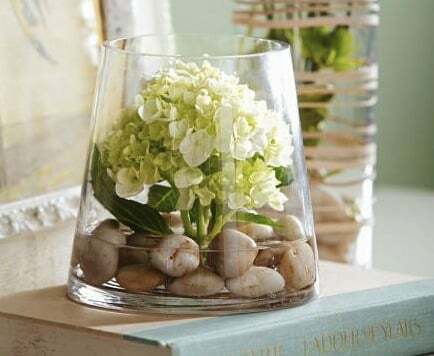 For a small, sophisticated arrangement with one or two fresh blooms, add a few smooth stones as filler to the bottom of the vase, as shown in Midwest Living. 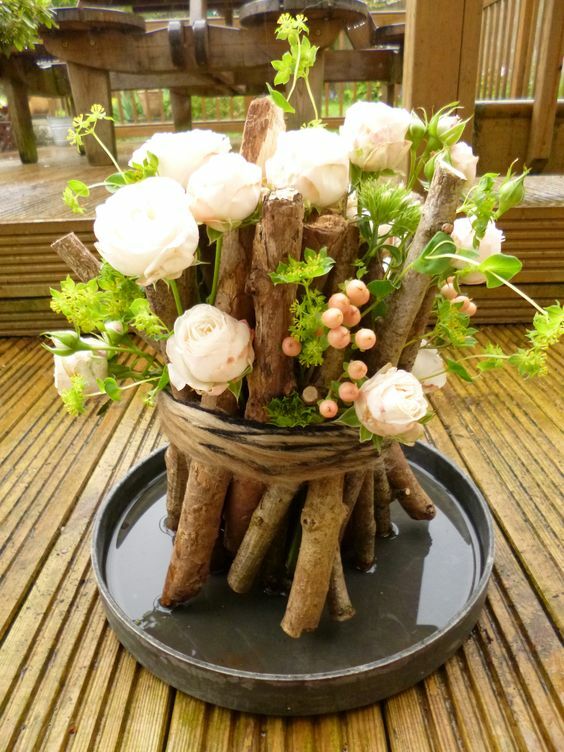 To bring more of an outdoorsy feeling inside, you can create a unique twig “vase” to hold your blooms, as shown on Deer Pearl Flowers. 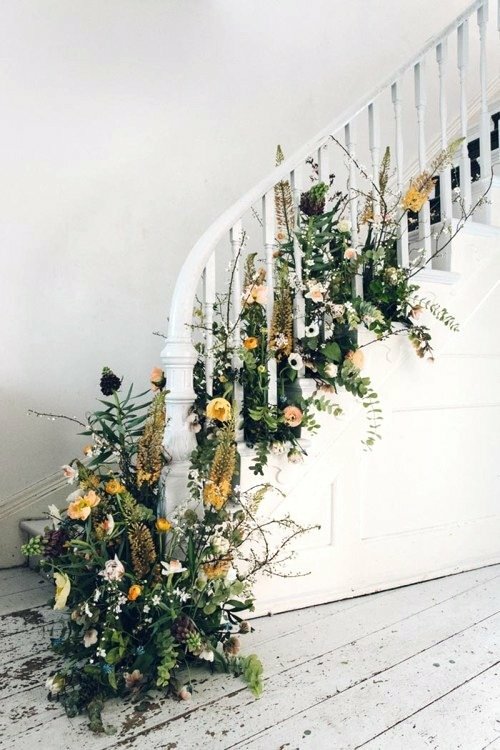 For a bridal or baby shower, spring brunch, or other extra-special occasion, you can wow your guests with this over-the-top gorgeous floral staircase display. 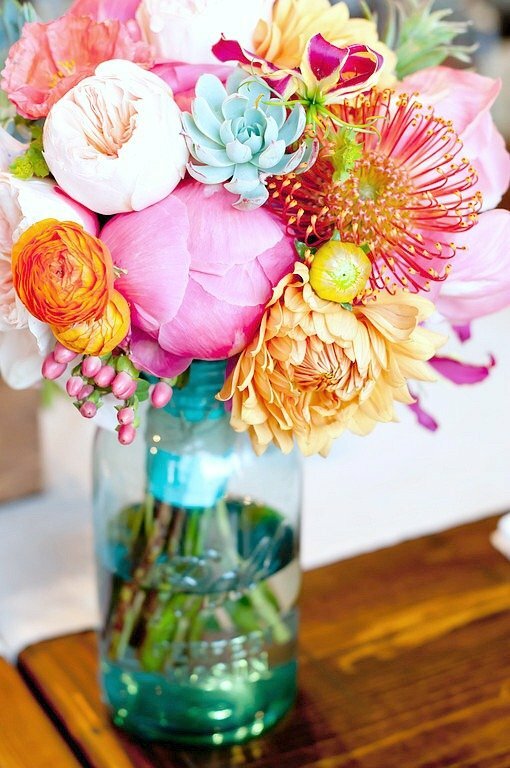 We hope you’re inspired to welcome spring into your own home with these creative flower ideas! These are absolutely gorgeous, want them all. Wow Christy these are beautiful and it’s so nice to see a lot of new ideas that I had not seen before. That trio of tulips and the staircase one are simply beautiful. Makes me want to go out and pick greenery and our cherry blossom is in full bloom and transform my hallway with it.